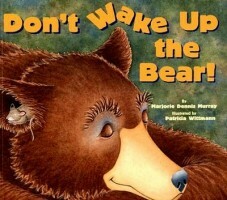 Title: Don’t Wake Up the Bear! Description: A sleeping bear becomes a warm, comfy place for many animals to keep warm in the cold. But this becomes a problem when a mouse with a cold wakes up the bear. have kids predict what animal is next? Can they think of another animal that lives in the woods? What might happen if they wake the bear? Great for simple why questions. Why are they whispering? Why are they sleeping with the bear? could use for voice volume. Lots of examples of whispering (when bears sleeping) vs. yelling (when bear wakes up). Could tie to the The Incredible 5 Point Scale and use for vocal volume. 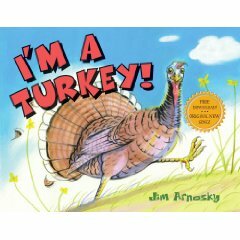 Description: The life of a turkey from his own perspective. 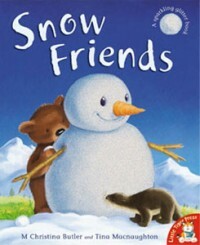 Why I like this book: It’s a fun holiday story. -Have children fill in the rhyming words, or generate other words that would rhyme. -Have children make their own thanksgiving poems. -for older students, discuss the turkey’s perspective vs. the hunter, vs. the farmer, etc. -For causals have children fill in “why” turkeys have to be careful…because…. Support books4all and order this book from Amazon.com. Thank you! 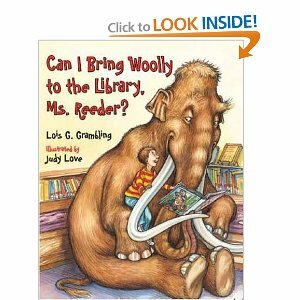 Title: Can I Bring Woolly to the Library, Ms. Reeder? Description: A little boy fantasizes about bringing a Woolly Mammoth named “Woolly” to the library. He provides many reasons why Wooly should be allowed, and predicts what would and could happen. 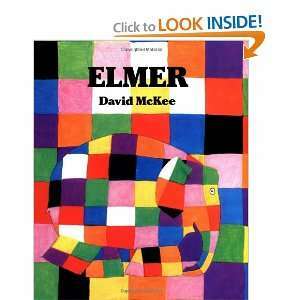 Why I like this book: The illustrations are wonderful for kids and grownups alike. 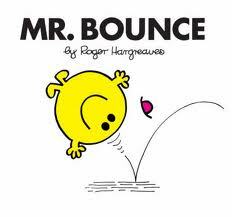 An entertaining story that can address many higher level language goals. The boy provides many predictions as to what might happen if Wooly comes to the library. Have students generate their own ideas. What could happen if a big animal comes to the library? How could he help? What problems might there be? Lots of opportunity for both implicit and explicit “why” questions. For example, Why does Woolly need slippers? (because he would make too much noise walking around the library; Why would Wooly be helpful at putting books away? (because he can reach the tall shelves), etc. The story ends with the boy realizing that Wooly may be homesick if he came to live with the boy. Have students discuss/write about a time when they were homesick? How did they feel and why? At the very end the boy suggests bringing another extinct animal (Saber Tooth Tiger) to the library. Have students create their own version of this story. Use a story generation app/software like the Story Patch App. Have then predict what could happen if that animal were to come to the library? Or to School? Description: Dozens of Mother Goose rhymes presented in familiar verse with exceptionally charming watercolor illustrations that appear to move across the page. Why I like this book: As my youngest child prepares to turn 18, I find myself reflecting on her childhood often. When she was 18 months old, Ali had a very high fever and croup. If her fever wouldn’t come down, I would need to bring her to the emergency room, again. Ali refused to swallow Tylenol with her hacking cough and I refused to bring her to the hospital. 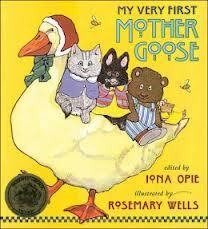 So, she sat on my lap in the rocking chair while I began singing each rhyme in this book. Ali did not let me stop until every single rhyme had been sung and by the end of the book, she was relaxed enough to take the Tylenol. We never made that trip to the hospital and that’s why I love this book! • A classic book to read anytime. It’s great when you have a little time available between activities. If kids memorize a few rhymes, they can say/sing them with the adult during transitions while they practice visualizing the illustration. • Discuss what the characters are doing in the pictures and what might happen next if the rhyme or story were to continue. • Create puppet shows with socks, paper bags or other materials. Have kids work in small groups and put on their “shows” for each other. • Discuss the range of facial expressions and overall body language. Make copies of expressive characters from the book and put them on 3×5 cards. Have kids take turns choosing a card and acting out the character’s expression and movement without talking while others follow the clues to guess, like charades. • Talk about what characters could be thinking (early theory of mind). 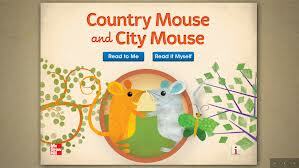 Description: A mouse that lives in the city visits a mouse friend who lives in the country. Although they both enjoy the visits, they long for their familiar homes. 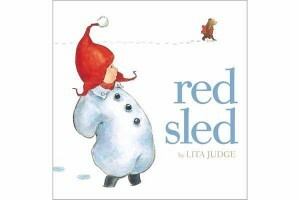 Why I like this book: I have always liked this story and recently discovered that it is also available as a sweetly illustrated e-book which did not disappoint! I remember reading this book or hearing it read to me when I was very young and was intrigued by how different the city and country environments were from one another. I enjoyed seeing the various activities each mouse shared with the other. I love this book today for the same reasons! • Great story to read before a play date. Talk with your child about the fact that their friend has had different experiences and may have different ideas about play. • Play a game called “If You Like” with a group of children after reading the story. For example, “If you like snow, jump to the wall”. Discuss and affirm differences as well as similarities. • This is a great story to act out. Split the group into Country and City mice and have them use materials around the room as props and sets. Have them invite the other group over to visit. The visiting mice will need to follow the lead of the “home” mice and then switch. • Acting out the story provides a wealth of opportunity to experience movement, deep muscle input and tactile sensations. Rolling down a hill, sliding over ice, and climbing up a tree are a few of the actions that can be mimicked. • The e-book presents different sounds for the country and the city. Discuss and explore sensory input that can be experienced through the senses in each setting. For example, traffic noises can be heard in the city and birds chirping in the country. You might find bakery smells in the city and smell flowers in the country. • Split the kids into 2 groups and have each group create sets for either the Country or the City. Then have the kids write a script and make sock puppets for a puppet show. Please support books4all and order this book from our Amazon Store. Thank you!